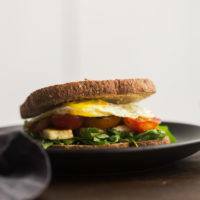 A filling vegetarian breakfast sandwich with fried cheese, eggs, and fresh summer tomatoes. To prep, cut the halloumi in to 8, 1/2 ounce slices and slice the grape tomatoes in half lengthwise. Heat olive oil in a skillet large enough to fry the halloumi and tomatoes. Heat over medium heat and add the halloumi followed be the tomatoes, cut-side down. Fry the halloumi until golden on each side, 1 to 2 minutes per side and cook the tomatoes until charring on the cut side, 2 to 3 minutes. Remove both from heat the skillet. Assemble the sandwiches by layering half the arugula, followed by the halloumi, fried tomatoes, egg, and the top piece of bread with a smear of mustard on it. Serve immediately.